5 years ago today, I started this blog called It Doesn’t Taste Like Chicken with my very first (embarrassingly bad) post Simply the Best Tomato Sauce. (Apparently, I was overconfident from day 1)! Way back then I had no idea that starting this blog would lead me to a complete career change leaving my job as art director to becoming a self-employed full-time blogger. Winning a competition and getting to film a cooking show with Food Network’s celebrity Chef Michael Smith. 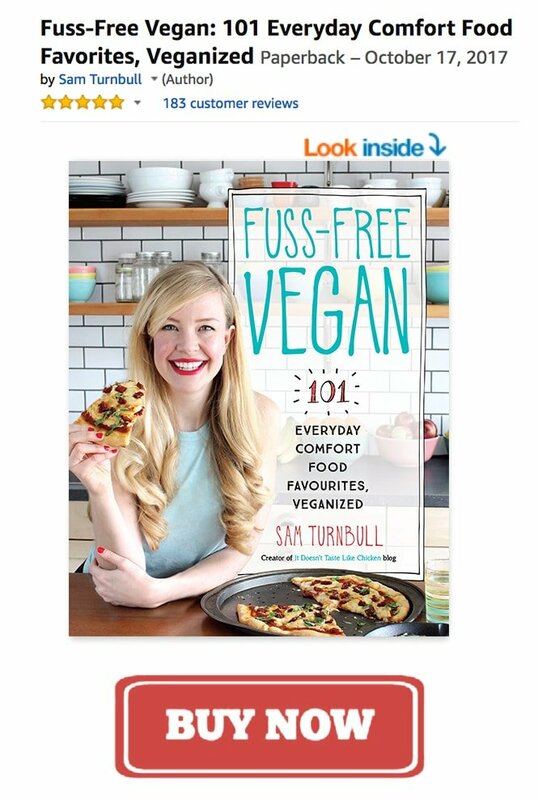 Writing my first cookbook Fuss-Free Vegan which now has over 150 5-star reviews on Amazon! And appearing on TV, radio, in magazines, on podcasts, and doing public speaking. It all happened very slowly and gradually, with a lot of very hard work, but when reflecting on the years, it seems like a whirlwind of delicious vegan recipes, 1 million dishwasher loads, over 15,000 comments, almost 500 recipes (with several thousand failed recipe attempts), and a smile every morning as I open my computer to start the day. So, I’m celebrating today, my blogs birthday with a Vegan Confetti Cake! Not only is it my blogs birthday but it also happens to be pride month, which makes this rainbow coloured cake even more celebratory! Celebrating the love of everyone. Now to cake. 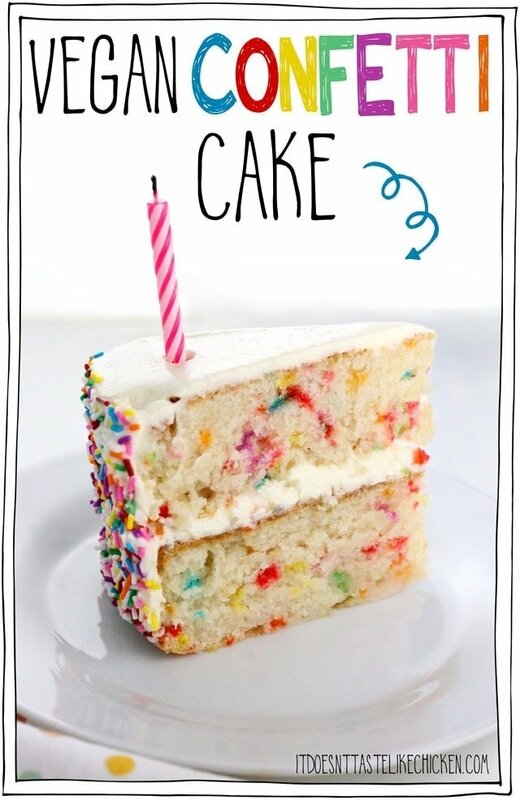 Vegan Confetti Cake is a vanilla cake filled with sprinkles because… CUTE! 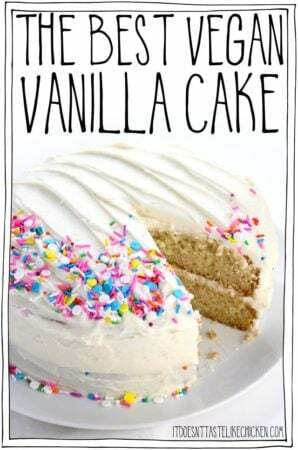 When first writing this recipe I tried to use my Vegan Vanilla Cake recipe and just stirred in sprinkles. This didn’t work too well. The cake was too fluffy and fell apart, and the sprinkles bled into a mess. So I did a lot of experimenting making this vanilla cake a little more dense (in a good way) to lock in those sprinkles, but still keeping it moist and fluffy by folding aquafaba into the batter. The vegan confetti cake comes out perfectly sweet, incredibly moist, hard to resist delicious, and the dots of colour throughout the cake are just to die for adorable fun. Vegan confetti cake makes for a great birthday party cake or any celebratory occasion. I chose rainbow sprinkles, but you could alternatively choose all one colour of sprinkle, maybe for a gender reveal cake, or any colour combo you like… galaxy cake? The options and fun are endless! 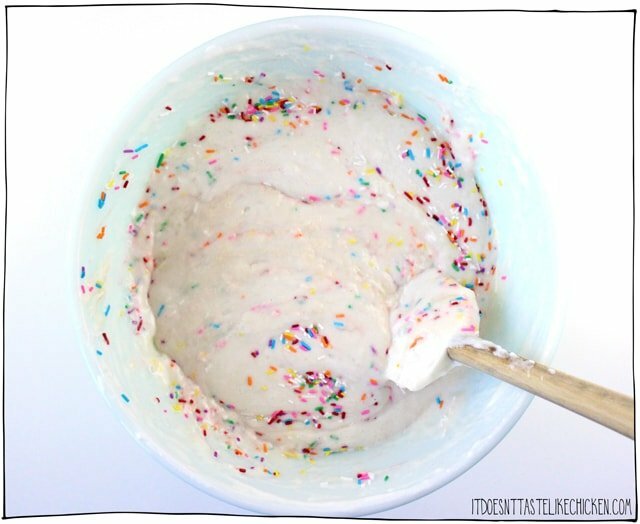 To make Vegan Confetti Cake: in a large bowl, whisk together the all-purpose flour, white sugar, baking powder, and salt. Now add the non-dairy milk, light oil, and vanilla extract and stir to combine. It will make for a very thick batter, almost like cookie dough. In another large bowl, use a stand mixer or hand beater to combine the aquafaba and cream of tartar until it forms stiff peaks. This will take about 3 to 6 minutes. Now fold the aquafaba into the batter. The batter is thick and it will take a bit of time to combine the two, so be patient. When the batter is combined you can lastly add the sprinkles. Depending on the kind of sprinkles you have they may bleed, so working quickly, scatter the sprinkles over the surface of the batter and then quickly give it 2 to 4 stirs to combine. It’s ok if the sprinkles aren’t mixed in perfectly, they will do their thing in the oven, it’s more important that they don’t bleed. A note on sprinkles. Not all sprinkles are vegan. They can sometimes include the ingredients confectioner’s glaze or shellac, neither of which are vegan as they both come from insects. I found sprinkles at a bulk food store that were accidentally vegan, but you can also order vegan sprinkles online on Amazon, on Etsy, from Sweetapolita, or from Fancy Sprinkles, to name a few place. Divide the batter evenly among the two pans. Bake for 35 to 42 minutes until a toothpick inserted in the center comes out clean. Let cool completely before frosting. 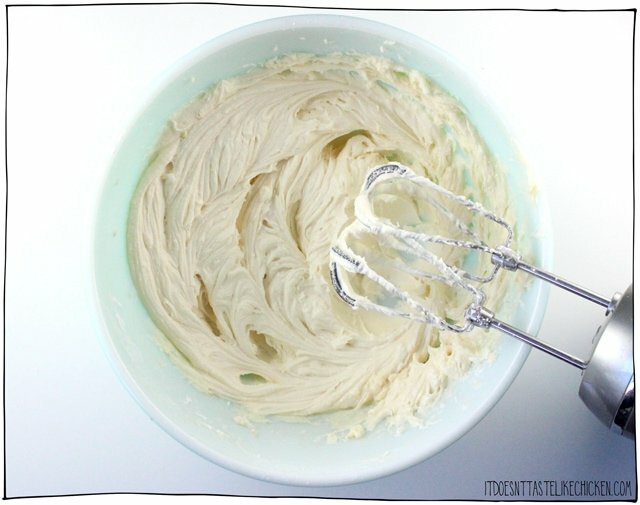 To make vegan vanilla frosting: In a large bowl, use a stand mixer or hand beater to mix together the vegan butter, vegetable shortening, powdered sugar, and vanilla extract until fluffy. 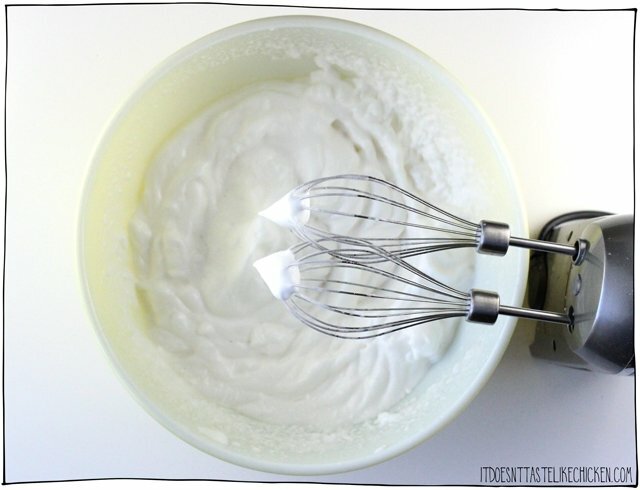 Add 1 – 4 tablespoons of non-dairy milk as needed to reach desired frosting consistency. Decorate cakes as desired. I covered the sides of my cake with sprinkles. I did this by placing the cake on a large baking tray (to catch any loose sprinkles), then grabbing handfuls of sprinkles, I lightly pressed them into the frosting on the sides of the cake working my way around and filling in any gaps until it was all covered. A delicious vanilla cake with sprinkles stirred into the batter to make spots of bright color throughout. Perfect for a vegan birthday cake! Deliciously moist and sweet, this rainbow cake is perfect for a birthday party. Preheat oven to 350F (180C). Lightly grease two 8" baking pans and line the bottoms of the pans with a circle of parchment paper. In a large bowl, whisk together the all-purpose flour, white sugar, baking powder, and salt. Now add the non-dairy milk, light oil, and vanilla extract and stir to combine. It will make for a very thick batter, almost like cookie dough. In a large bowl, use a stand mixer or hand beater to mix together the vegan butter, vegetable shortening, powdered sugar, and vanilla extract until fluffy. Add 1 - 4 tablespoons of non-dairy milk as needed to reach desired frosting consistency. Wow amazing receipe! The batter already tastes amazing. I baked this with 12 little pre-K students for a birthday and we cant wait to eat the cupcakes. Thatnk you for the wonderful blog! For the icing: Will it work without the shortening? So happy you’re enjoying it, Spencer. The frosting will work, but it won’t be as stable as vegan butter melts easily. Make sure to keep everything cool, and store the cake in a cool place to prevent melting. Enjoy! I made this yesterday for my daughter’s birthday and it turned out beautifully!! Everybody was commenting on how moist and delicious the cake was. I think this will be my go-to birthday cake from now on. Thanks for the recipe! When I’ve made layer cakes before, I popped the layers into the freezer to make them easier to handle/ice. Would it be all right to do that with this cake too, or do you think leaving it in the freezer for too long would compromise the texture of the cake? That should be just fine. Just make sure they cool completely at room temperature before freezing. Enjoy! This is an excellent recipe! I have made it twice for birthdays and my mom has requested it for hers as well. I’m the only vegan in my family so pleasing them with a vegan recipe is a major win. Coconut oil can melt easily at room temperature so if you give it a try be sure to keep the cake in a cool place or the frosting may melt. Enjoy! Awesome cake recipe. So easy. Will totally make it again. Thanks for another awesome recipe Sam! Ok, so I’m doing this cake right now and the batter wasn’t cookie dough as you mentioned. I’m wondering if the Aquafina needs to be measured as a liquid or as a foam. I just got the 2/3 liquid straight from the can and after it was nice and fluffy poured the whole thing in my batter. Now I’m wondering if I did it wrong. HI Michelle, the aquafaba should be measured as a liquid, you did it correctly. The dough will be thick like cookie dough before you fold in the aquafaba. Once folded it in will be much lighter and fluffier. Hope that helps! Hi Katie, so glad you’re excited! I have not made cupcakes with this recipe yet. It would work just fine, the oven temperature would be the same, the baking time will just be a little less. I would keep an eye on them around the 18 minute mark and when they start looking cooked, test them by poking them with a toothpick. When the toothpick comes out clean they will be done. Enjoy! That’s so wonderful, Kelly! I’m thrilled you get to enjoy the celebrations. As a former egg eater, I can assure you that this cake tastes just like any egg-based cake, you would never know the difference. If you want a fun experiment try my vegan toast dipping sauce recipe which tastes just like an egg yolk!! 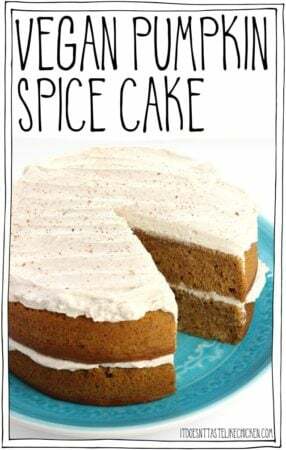 I want to make this cake for my daughters birthday coming up, but she needs the recipe to be gluten free, can I replace regular flour with bobs red mill gluten free flour? Gluten-free baking is a whole other beast and I’m not an expert at it. I have heard good things about Bob’s Red Mill 1 to 1 tho. I tried this recipe twice and followed the recipe exactly and both times came out flat and dense. I was hoping for the fluffiness that everyone described. I even went out and got new baking powder. I’m so sad :(. Any ideas on what went wrong? Hi Kay, it’s difficult to know without being in the kitchen with you. Overmixing the batter can cause cakes to not rise. Or oven temperatures can often be wrong which could cause the cake to not rise, it’s always a good idea to pick up an oven thermometer to be sure. I hope that helps a little! I am so glad I found you! I have been searching for a recipe that I could successfully bake vegan. Thank you! Can I use cane sugar? Is that the same as white sugar? Thank you! Turned out amazing…just want to know can I keep in the fridge? So happy you enjoyed it! You can store it at room temperature in a cool place, or in the fridge. Enjoy! Thanks! It turned out SO cute everyone loved it. I did strawberry filling between the 4 layers and the frosting from this recipe on the outside with a blue tint and lots of sprinkles ❤️ the cake was DELICIOUS! thanks again!! 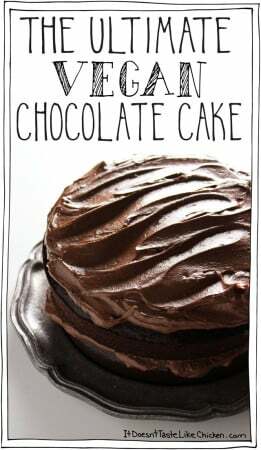 I’m going to make this today for a new years cake I think I’m gonna add some blue food coloring to the frosting and use sparkler candles, and maybe make it a 3 or 4 layer cake. Can’t wait I already know it will be fabulous. Hi! Could I pour the entire batter into one 9×11 instead of 2 round cake pans? Yes, but it will just take a bit longer to cook, so keep an eye on it and do the toothpick test method to ensure it’s done. Enjoy! 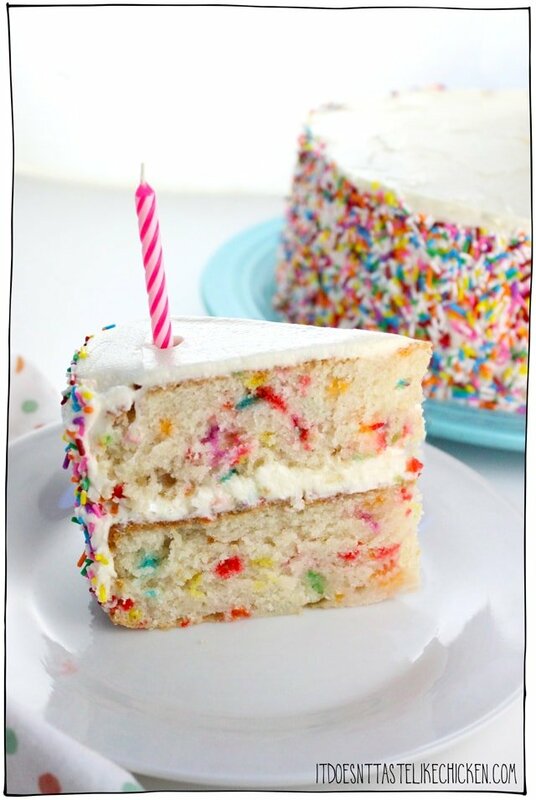 I am hoping to make a dairy-free funfetti cake for a friend’s birthday soon, and your recipe is just what I was looking for! Do you think the recipe would still work out if I added a little bit of strawberry puree for a fun flavor and a slight pink color? Or should I stay on the safe side and stick to the original recipe? So happy you found it, Elise! I would recommend sticking on the safe side and following the recipe as written. BUT I think it would be lovely to do a strawberry puree between the layers of the cake. Yum! Enjoy! I made this cake for a friend’s birthday. I had never made icing before. I used my neighbours kitchen to make this because she used to be a baker and I know she has all the tools! It turned out fab even though the sprinkles bled. The cake was moist and fluffy, i doubled the vanilla on the icing, and it turned out great! Now I’m thinking about buying a mixer! Awesome!! SO happy you enjoyed it so much, Andy. For the sprinkles, they will bleed which is why you just have to give it one or two very quick stirs to mix them in. 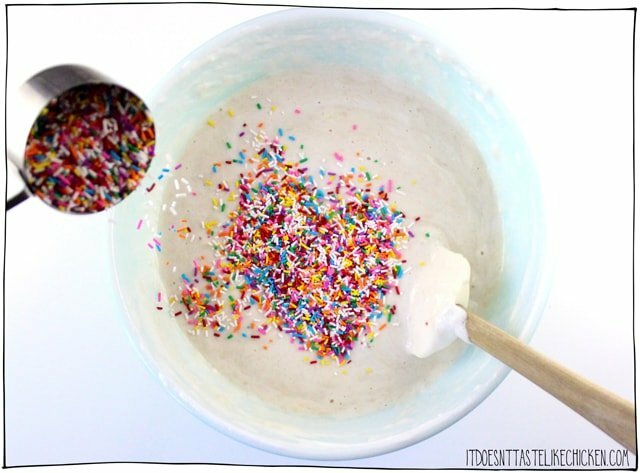 You could also try a different type of sprinkle like a confetti sprinkle which won’t bleed. Hope that helps! Hi, I would class myself as a quite experienced baker, but I never tried a vegan one. I tried this receipt today and followed the instruction, but it’s just not right. The taste is lovely , but the texture is all wrong. It seems very claggy. What have I done wrong. Heeeelp!!!! Oh no, sorry to hear that, Kim. It’s difficult to know what went wrong without being in the kitchen with you. If it seems sticky then it might be underbaked. Hope that helps! 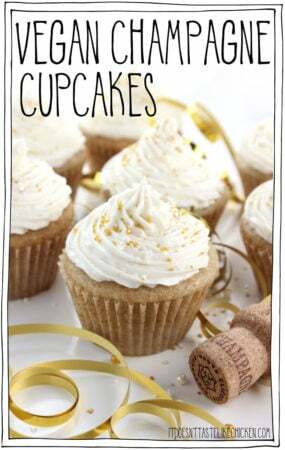 I’m planning on making this for a birthday party very soon! Love, love aquafaba!! I was wondering if you had used 3/4 cup of reduced aquafaba or just straight from the can? If you used straight from the can, do you think reduced would work as well? Hi Ruchi! I used straight from the can. I’ve never tried reducing aquafaba so I’m afraid I don’t know what the results would be. Enjoy! Can flaxegg be used instead of the chickpea water? No, not for this recipe. Aquafaba is a must. Enjoy! 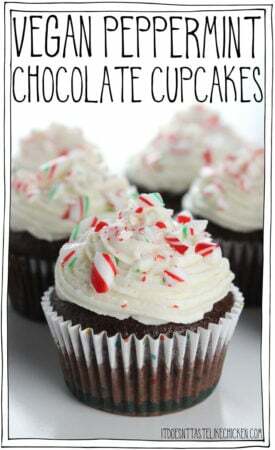 I love your frosting recipe but how do you get it to look so white? Mine always ends up with a yellowish tint. The yellow-ish tint you are experiencing would come from the vegan butter and/or non-dairy milk you are using. (Assuming you are using white powdered sugar and white vegetable shortening). So perhaps your vegan butter is quite yellow? My go-to is Earth Balance. Okay thank you! I was using a yellow vegetable shortening so that’s probably why. Can I use this funfetti recipe to make cupcakes? Ah there you go! Absolutely, they would just take less time to bake, so keep an eye on them. I’d guess about 15-20 minutes. Enjoy! Thanks! For sure, or you could just try my vanilla cake recipe. Enjoy! Love this! Made a double batch to make a unicorn cake for a 7th birthday and it turned out amazing! Hi Sam! I’m making this for my daughter’s 2nd birthday and I accidentally put the aquafaba and the cream of tartar in with dried ingredients! What kind of mistake did I just make? Is it worth continuing or should I start over? Thank you! I would suggest starting over. Good luck! What type of shortening do you use? Is crisco vegetable shortening okay? I’ve purchased earth balance before but have been having a hard time finding it lately! Thanks! Yep, Crisco is what I use, as I think the Earth Balance brand got discontinued, unfortunately. I’m so happy about your blog. Just one question what is tartar??? Thanks, Chanel! Cream of tartar is a dry white powder used in this recipe helps stabilize the aquafaba foam. You can find it in the spice aisle of your grocery store or here on amazon. There are no eggs in this recipe so you are good to go! My blog is vegan, so there are never any eggs in my recipes, you can make any recipe you like from my blog without the worry of replacing eggs. Enjoy! Made this into 24 cupcakes for my daughter’s 5th birthday. 17 minutes baking time was perfect! The cupcakes were a hit. Super moist and delicious. And the best part is there are cupcakes left over for me to enjoy after the littles go to bed! Thanks Sam for creating the perfect cake recipe to help us celebrate our daughter’s birthday. As soon as she saw this on your website, she knew this was the cake she wanted. ahh! 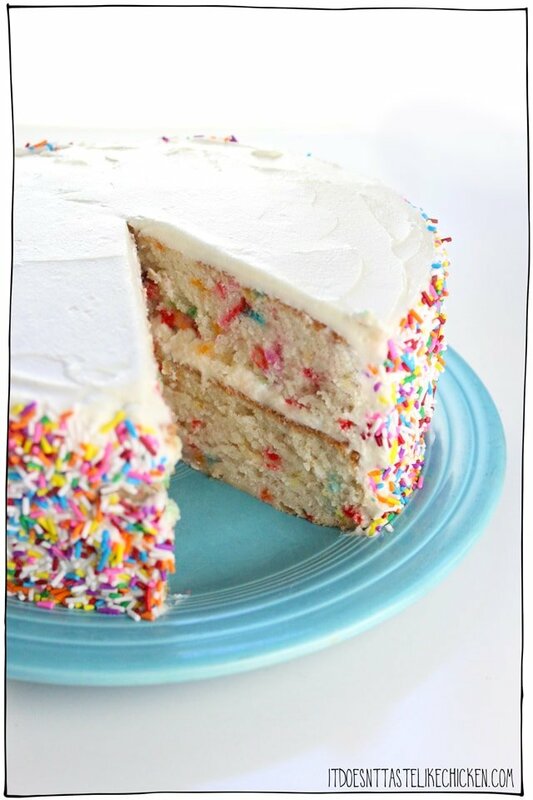 funfetti is my favorite type of cake, and the texture of this cake looks perfect. cannot wait to try this recipe! i just had a birthday, so i think it’s still acceptable for me to celebrate, right!? happy belated blogaversary! thanks for all you do! Absolutely!! I’ve had slices of this cake in my freezer and have been taking a slice out and celebrating even the tiniest of accomplishments! I folded the laundry… time to celebrate! Haha. Enjoy! Hey Sam… Happy 5th birthday to IDTLC. I’ve been following for almost that long. I remember “the ex”, I remember you quitting your job to do this full time. I remember you doing the 100 ingredients/100 recipes. Gosh, feel like I’ve grown up with you (despite me being old enough to be your vegan babysitter!). You are a virtual part of our family. You only need one name around here (“Sam”… kinda like Cher, Madonna, Britney… only much better!). Anyway, my daughter wants this cake for her 5th birthday party (July 14) – how fitting… she’s been vegan as long as IDTLC! She wants cupcakes. How long do you think I would cook cupcakes for? I never understood people who don’t respond to comments. Isn’t it “social” media? Haha. If someone takes the time to leave a comment I will take time to respond. I wish you luck! Keep extra sprinkles in your pocket and you can throw them to distract the kids and escape! What a lovely surprise that would be!! To get the sprinkles on the side, I put my cake in the center of a large baking sheet (to catch the sprinkles) and then I just took handfuls of sprinkles and pressed them into the frosting on the sides of the cake. Repeating and turning the cake as needed until all sides are covered. Enjoy! Hey girl! Did you know that regular sugar isn’t vegan(big gulp, I know). They mix it with bone char when they process it. Better to buy/use coconut, maple or yacon root sugar. I haven’t used white sugar in years now but realize I’ve probably ingested the bone char when I’ve treated myself to the vegan bakeries around town. I also found out that brown and powdered sugar are made from the white processed sugar so they have the bone in there too. : / Bummer, huh. Hope this is helpful to anyone who didn’t know. Hi B, actually, a lot of brands of white sugar are totally vegan. Using bone char to refine sugar isn’t very common anywhere other than the US as far as I know, but I do check the sugar I buy to make sure. The standard brand I use here in Canada is Redpath and they say on their site that the sugar is indeed vegan-friendly. So you just want to check the brand you’re purchasing. A helpful tip is that all organic sugar is always vegan-friendly. Hope that helps! Hi Sam – did you get the sprinkles from Bulk Barn? Can you also find cream of tartar there? I did, yes! I imagine cream of tartar would be there, or it is available at any grocery store in the spice section. Enjoy! Thank you. Will be making it this weekend for Father’s Day! Hey Sam! 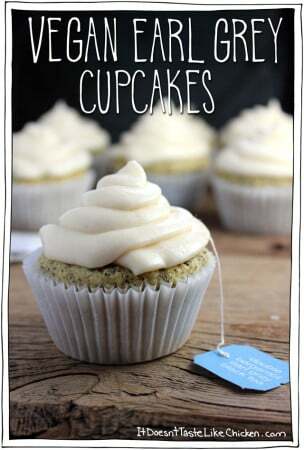 Do you use unsalted butter for the frosting? If so, where do you buy your vegan unsalted butter from? I love your recipes!!!! Happy BLIRTHDAY Sam! I’ve been reading your newsletter for a while now and just bought your book. Love it! Keep up the great recipes and fun newsletters, I enjoy reading them. Aw Sam! Whadaya wanna be when you grow up? You should open a vegan bakery. I know I’ll find the perfect occasion to make this cake. Can’t wait. Wow, I didn’t realize I’d commented that many times. Most ever of any blog I read. (You respond the most, too.) You’re welcome and thank you for supporting my veganism in a omnivore world. Sam, you’re the best! Happy birthday to IDTLC!! I definitely plan on making this. In fact, the first all vegan food I ever made was your Heart of Palm Calamari. Question: after I ate it, the grease hurt my tummy a little. Is there an alternative? I feel like I maybe cooked it wrong. Thank you so much!! Fried foods are never good for us so maybe you are just more sensitive to that. I hope you love the cake! Happy 5th birthday IDTLC.com! Congratulations Sam! Ironically, just yesterday my hubby planted the “let’s make cake” seed in my brain. Headed straight to your book and now I have a couple of frosting-related questions for you. 1. What do you suggest for non-hydrogenated shortening? I see Spectrum and Nutiva in a web search but I’ve never tried either. 2. We use Melt spread (similar to Earth Balance but yummier) from a tub. 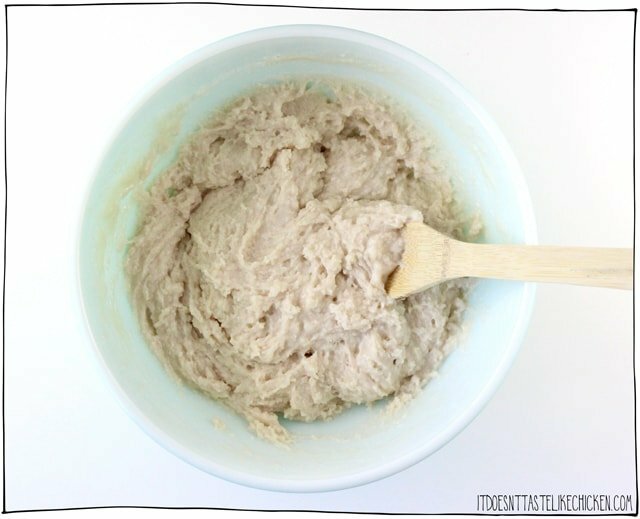 Do I need to use vegan butter in stick form for successful (and edible) frosting? I tried Earth Balance sticks for cookies in the past and it was like plastic, ick. Can’t wait to hear your suggestions…the cake is awaiting your reply! Thank you so much, Karen! I used to use Earth Balance non-hydrogenated shortening, but I believe that was discontinued. So I have been using regular shortening. If you want to opt for non-hydrogenated I am sure either of those brands will work great. I’ve never worked with Melt, so I am not sure what it’s like, but I use Earth Balance in the tub (not the sticks), for all my baking needs. Hope that helps! Let me know how these work! I’ve been on the hunt for a non-hydrogenated vegetable shortening for ages! I work in a small Health Food Store (where we carry Sam’s book 🙂 and haven’t found a supplier that we can get Nutiva or Spectrum shortening from! The whole thing is really bizarre! I miss Earth Balance! Yes, so sad, I miss Earth Balance too!! Yayyyy!!! What a great accomplishment and perfect celebratory cake for the occasion. We love you in our family and refer to all of your recipes as if we know you personally…for example, my husband will say “is this Sam’s?” when I make something from your book or blog. We all love how personal you’ve made each recipe and your whole journey. Our young daughter is a huge fan and helps me cook all the time. Thanks for these 5 years and cheers to MANY MANY MORE!! Happy 5th Birthday! I don’t know what I’d do without your blog and all of the amazing recipes you put out. I can’t wait to try this one! Aww that’s lovely, thank you, Kat! Happy Birthday to your blog Sam! The cake looks delicious! Happy 5th!!! I think the appropriate vegan 5th anniversary gift is 5 lbs of golden flax meal!!! Celebrate! Funfetti Cake – how I yearned for one when I was a kid, but – nope, my mom always made her white cake with a whipped-cream icing. It was good, though! What I like is that you have given a festive cake recipe to families to make their celebrations really, well, ..Fun! I hope to make it for birthday “girls & boys”(I’ll be in a Senior Apt bldg, 62 and above! 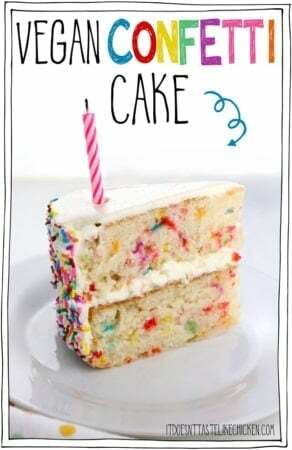 ), when I move into my new home this year – I want to be “Birthday Cake Lady”, and this is perfect! Congratulations on your anniversary, Sam! And what a pretty cake to celebrate with! Looking forward to making it. Your vegan vanilla cake (which I used for your tiramisu). was delicious, so I’m confident this will be, too. Two questions: Does the aquafaba have to come from chickpeas canned in only water (no salt or preservatives)? And as I live in the GTA, I’m wondering if you found the vegan sprinkles at Bulk Barn. Thank you so much, Ali! Aquafaba can come from any old can of chickpeas, so no stress there. Yes, I did get the sprinkles at Bulk Barn. I had to ask to see the ingredients when I told them it was because I didn’t want insects in my sprinkles, they tried to sell me cricket bars?? Haha. I also noticed that Cake Mate sprinkles here in Canada are accidentally vegan, but I do not believe they are vegan in the US, recipes for brands are often different when crossing the boarder.